When I compose music for a film, I try to make an organic connection to what I see or hear on screen and how I approach the score. 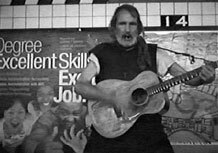 With Native New Yorker, because it is a "silent film", what I latched onto as a link between the music and visuals was choosing instrumentation inspired by the abundance of so many street musicians. The layering of rhythms and the incessant pulsing of the music reflects the energy and the many facets of the city as well as the motion and pace of the images created by Steve Bilich. In addition, the "flicker" caused by the use of the silent film era camera suggested the tempo and pulse of the music. We see a myriad of musicians on the street, and I try to bring out their spirit in my music. For example, as both violin and guitar buskers appear on screen, we hear strings and guitar throughout, as well as percussion instruments for the drummers seen in the park. Additionally, piano, while not on screen, plays a prominent role as a nod to the music of the silent film era. The music that I composed, however, approaches the film with my sound and rhythm tendencies which blurs the sense of time. We hear the haunting sounds of Native American chanting, as well as Middle Eastern vocalizing, representing characters, actions and events both on and off screen. The breathy sounds of the native flutes are emblematic of the life force present and shared by all cultures.